On 3 December 2012, the 15th round of negotiations on the Trans-Pacific Partnership Agreement (TPPA) began in Auckland, Newe Zealand and included, for the first time, eleven negotiating parties with the additions of Canada and Mexico more than a year after these two countries formally asked to join the negotiations. The current negotiating parties now include Australia, Brunei, Canada, Chile, Malaysia, Mexico, New Zealand, Peru, Singapore, the United States, and Vietnam. Rumored interested countries include Japan, Thailand and South Korea. Thailand was specifically mentioned in the stakeholder briefing with the US Chief Negotiator, Barbara Weisel, noting that there are no invitations to countries to join the TPPA and countries self-determine whether it is in their interests to join and that the US does not make unilateral decisions or invitations. The US Chief Negotiator stated that Thailand expressed interest in joining and that the US told Thailand to also consult with all the other negotiating parties. The round began with controversy when the host country, New Zealand, locked stakeholders out of the negotiating venue for all but one day (the day for stakeholder presentations) of the negotiating round. This increasing lack of transparency led to a joint statement from several NGOs focused on intellectual propert criticizing the decision to exclude stakeholders from entering the convention center. At the stakeholder briefing, many of the questions asked revolved around agriculture and tobacco, two important issues for New Zealand. Many of the questions over the course of the briefing were fielded by the New Zealand Chief Negotiator, even ones that appeared to be directed at the US Chief Negotiator when it became apparent that she did not intend to answer the question. The New Zealand Chief, when asked if New Zealand would make concessions on the pharmaceutical chapter in exchange for greater market access on dairy, stated that they would not trade away the fundamentals of New Zealand’s health system, including pharmac. The US Business Coalition for the TPPA asked what was being on the development issue. Peru noted that they were pushing for new provisions in relation to development and has received good feedback on the proposals Peru tabled to address this challenge. The US noted an intention to make the development chapter robust, but that the development negotiators were not at the Auckland round because they had just been at an intersessional round that was held in Mexico. She noted that they were also not in the previous round in Leesburg. Vietnam noted that development issues are addressed not only for the stage of development, but also to raise the capabilities now. A stakeholder from the New Zealand nurses organization asked the New Zealand chief to commit not to agree to higher standards of intellectual property agreement than are contained in the WTO TRIPS Agreement. In response, the New Zealand Chief Negotiator stated that they were “looking to find outcomes that is in the mutual interests of all of us,” failing to directly answer the question regarding TRIPS-plus measures that are on the table. A question was asked regarding whether countries that try to regulate in the interest of protecting consumers (for example, regulation of banks) would be safe from investor-state lawsuits. US Chief Negotiator noted that it was up to investors to determine whether to bring suit or not. She did, however, note that it is the job of the government to protect the consumers, such as the provisions of the United States act on financial regulations seek to do. Several stakeholders asked questions regarding tobacco exceptions, including AMSA which directed its question to the US questioning why tobacco is being treated as any other product by USTR when it is considered a special product in the US. The US stated that they were still consulting internally on the tobacco proposals. New Zealand noted that it was engaged in consultation on the plain packaging approach and believed that tobacco could be regulated in this manner consistent with its international obligations, including on trade. A later question on the US proposal’s impact on the flexibilities of other countries in the copyright space asked by the Australian Digital Alliance elicited a response by the US Chief that the US feels its copyright proposals are at the “appropriate” level to protect and promote innovation. It also noted its view that its text on copyright limitations and exceptions is very flexible. With respect to a question from EFF on balancing privacy concerns with other issues, such as e-commerce, the Chilean Chief Negotiator noted that they were looking for free flow of information, but that a balanced agreement would have corresponding exceptions. A stakeholder from the Malaysian AIDS Council asked if the US would table the new pharmaceutical text (also known as the “TEAM” provisions that had been widely rumored to be under revision/reconsideration by the United States following intense opposition after it was tabled in September 2011). The US responded “we know people are patiently waiting for new pharmaceutical text,” noting that it is a “complex, controversial and sensitive” issue. She stated that USTR will take the time necessary to develop a proposal that would have administration and congressional support. Someone from a generics pharmaceutical company in New Zealand noted that the leak of the US’ so-called TEAM proposal on pharmaceuticals noted that the leak of the proposal allowed for good discussion and input and asked whether the new/revised text would be made public once it is tabled so that the discussions and engagement could continue. Although it seemed that the question was again directed at the US, the US Chief Negotiator seemed disinclined to answer the question and the New Zealand Chief once again stepped in to answer. New Zealand stated that they needed “space” to try new ideas and that they call for public submissions and engage with stakeholders, but said that they would not release the text. New Zealand noted that the text only goes out when there’s an agreed deal and then gets sent through the parliamentary procedure. On the transparency point, the New Zealand Chief Negotiator seemed very proud of the level of transparency in the TPPA negotiations. He made a point of noting that the TPPA negotiations were suspended for half a day so that the negotiators could go to the stakeholder presentations if they wanted. Another question directed at the US asked whether the agreement was “anti-China.” The US stated that the TPPA is open to any APEC country and is therefore not anti-China. That said, the US Chief Negotiator added that the US proposals were designed to address “problems in the global economy” and was not targeted at a country, but rather, a problem. Another big topic for the round surrounded dairy and a stakeholder from Teamsters asked Canada, the US and NZ about whether dairy would be off the table given that it was not included in NAFTA. Canada again took the position that they had come into the negotiations with a commitment to achieve a high level, ambitious agreement which includes discussions on all issues. New Zealand noted that the entire dairy industry in New Zealand is smaller than the dairy industry for the state of California. The US had an interesting response on this point, stating that having Canada in the negotiations changed the dynamics in a positive way in terms of tradeoffs and balances, helping the US. She did not mention what other areas Canada’s entry into the negotiations has sparked a benefit for the US in terms of support for its proposals. Once again, patent provisions were not discussed as the agenda focused on trademarks, geographic indicators, a select group of copyright provisions, and intellectual property enforcement. Patents have not been discussed since the Melbourne round in March; if the next round does not take place until March 2013 as is widely expected, a whole year will pass without any discussion on the patent provisions (including the highly controversial “TEAM” text the US tabled with regard to patent linkage, exclusive rights over test data and patent term extensions). The US has apparently not made any commitment as to when it will, or even if it ever will, table revised “TEAM” proposals. Other countries have yet to table counterproposals or alternative text in this area. With respect to copyright, it appears that copyright limitations and exceptions remains a controversial topic. The United States continues to insist that its proposal is a flexible one. However, the US proposal would restrict limitations and exceptions to those that comply with the three-step test, a test that was interpreted restrictively and narrowly by a WTO panel. Potentially, the US proposal could create problems by requiring those limitations and exceptions that are specifically set outside the three-step test (those that are specifically provided for by the Berne Convention, for example) comply with the three-step test. The US proposal therefore continues to remain a hot topic in the negotiations. Although it was the first round of negotiations for Canada and Mexico, they were reportedly active participants. While it appears that where the texts have been closed and agreed upon, new new proposals can be made, countries are still able to table text in the areas where brackets remain. For contentious chapters, such as the IP chapter, it appears that there is still opportunity for Canada and Mexico (as well as the other TPPA negotiating parties) to table their own proposals. Intellectual property once again remained one of the hottest topics in the negotiation. On the day allotted for stakeholder presentations, there were four rooms running presentations simultaneously and each presenter was given fifteen minutes to speak. KEI spoke on IP enforcement issues and its impacts for developing countries as well as briefly touching on the Republic Study Committee report on how to fix copyright. Unfortunately, I was unable to see most of the IP presentations due to the fact that three of the four rooms were running the IP tracks simultaneously, thus making it difficult also for IP negotiators to see all the relevant presentations. Civil society was active during this round of negotiations, including a rally/protest held on Saturday, 8 December 2012. 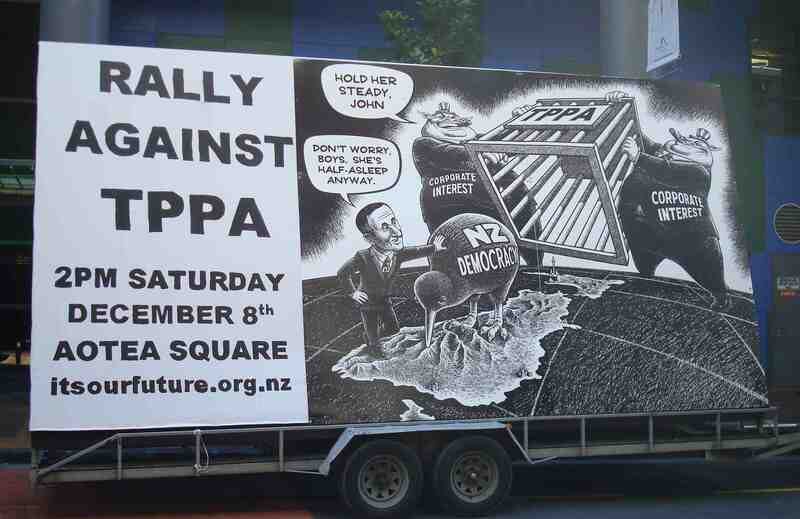 A cartoon competition/exhibit on TPPA took place and the winners of the competition can be viewed here and the other cartoons can be seen here.. As noted below, more than 200 organizations registered to attend the negotiations and some organizations had more than one representative attend. Although no formal announcements have been made, Inside U.S. Trade reports that the next round (tentatively scheduled for March 2013) is rumored to be hosted by Singapore and the following round (May 2013) will be held in Peru. Roughly 50 of the 214 registered organizations were from the US; expectedly, a high number of stakeholders were registered from New Zealand. Intellectual property stakeholders included for example, the American Medical Students Association, the chapters of the American Chamber of Commerce in New Zealand, Vietnam and Mexico, Amgen, ASIFLA (Associacion Industrial de Laboratorios Farmaceuticos), the Australian Digital Alliance, BSA Software Alliance, Consumer International, Douglas Pharmaceuticals, eBay, Electronic Frontier Foundation (EFF), Electronic Frontiers Australia, Generic Pharmaceutical Association, GlaxoSmithKline NZ, Google, Hiperderecho, Hospira, IBM, Interactive Games and Entertainment Association, International Association of Music Libraries (NZ), International Trademark Association, Internet NZ, Public Health Association of Australia, Library and Information Association of New Zealand Aotearoa (LIANZA), Medicines Australia, Medicines New Zealand, Mexican Institute of Industrial Property, MFJ International, Mylan Inc., Mylan New Zealand, New Zealand Game Developers Association, New Zealand Institute of Patent Attorneys, New Zealand Medical Association, New Zealand Medical Students Association, New Zealand Nurses Organization, NZ Rise, ONG Derechos Digitales, OpenMedia, Pfizer New Zealand, Public Citizen, Publishers Association of NZ, Sanofi New Zealand, Screen Producers Association of Australia, Southeast Asia Tobacco Control Alliance, The New Zealand Society of Authors (PEN NZ Inc.), The Walt Disney Company, Third World Network, Time Warner, Universities Allied for Essential Medicines (UAEM), US Chamber of Commerce, US-ASEAN Business Council, Warner Brothers, Watson Pharmaceuticals, and Yahoo! Inc.